My Life and Activities here in KSA..: Floods in Phillipines..
MANILA, Philippines (AP) — The second typhoon in a week battered the rain-soaked northern Philippines on Saturday, adding misery to the lives of thousands of people, some of whom were still perched on rooftops from previous flooding. Thousands of people were ordered to evacuate their homes after Typhoon Nalgae slammed ashore south of northeastern Palanan Bay in Isabela province with winds of 100 miles (160 kilometers) per hour and dangerous gusts of 121 mph (195 kph). At least one person was killed in a landslide. The fast-moving typhoon blew westward, barreling across the mountainous regions of Luzon Island. It weakened slightly as it reached the shore of La Union province around 4 p.m. (0800 GMT), about seven hours after it made landfall. Forecasters said it will be over South China Sea by Saturday night and is expected to regain strength over the water as it heads farther west toward Hainan and Vietnam. A landslide in northern Bontoc province smashed into a passenger van on a mountain highway, killing one passenger and injuring another, Civil Defense chief Benito Ramos said. 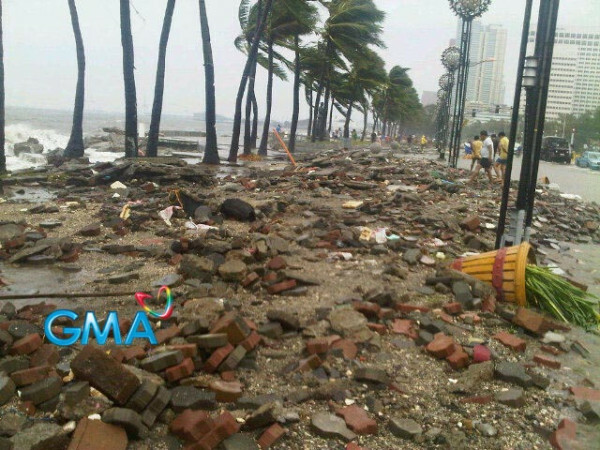 The typhoon took a similar path across areas on Luzon saturated by Typhoon Nesat, which trapped thousands on rooftops and sent huge waves that breached a seawall in Manila Bay. The Office of Civil Defense said the death toll from Nesat has risen to 52 after two more victims drowned in its floodwaters. It said 31 others were missing. Nesat also pummeled southern China and was downgraded to a tropical storm just before churning into northern Vietnam on Friday afternoon, where flood warnings were issued and 20,000 people evacuated. There were no immediate reports of casualties in Vietnam and the country did not appear to have suffered any major problems. In the Philippines, nearly 400,000 hunkered down in evacuation centers and in homes of relatives and friends along the new typhoon's path. There was heavy rainfall of about an inch (25 millimeters) an hour within the storm's 340-mile (630-kilometer) diameter that put the northern provinces including the capital on alert. Isabela authorities earlier shut down electricity in the province to prevent accidents from falling power pylons and snapped cables. The howling winds toppled trees and blew away tin roofs of some houses in Isabela's provincial capital of Ilagan. In nearby Luna township, a bus with about 30 passengers fell on its side on a rice field because of the strong winds, but no one was seriously injured, police said. "The ground is still supersaturated and it cannot absorb more water," said Graciano Yumul, the Philippines' weather bureau chief. "This will just flow down to rivers and towns, and there is a big possibility that landslides, flash flooding and flooding could occur." He urged residents still refusing to leave their homes despite the floods from Typhoon Nesat to evacuate because the water was going to rise as Typhoon Nalgae, aggravated by the seasonal monsoon, dumped more rain over the northern region, including the capital, Manila, later Saturday. Yumul said the evacuation is "non-negotiable" because lives are at stake. At least five towns in the rice-growing province of Bulacan and Pampanga, north of Manila, remained submerged three days after Typhoon Nesat had moved on. "We have nowhere to go," Celenia Espino of Calumpit township said from her home, which was filled with knee-deep murky water. "We have no means of transportation out of here." She was one of the thousands who sought shelter on rooftops with no food, water and electricity, while a procession of other residents waded in chest-deep water down main roads to reach dry land. Ramos said rescue boats would be sent for the residents before nightfall. Elsewhere, Ramos said there had been no contact with several coastal towns facing the Pacific Ocean that were in the path of the typhoon hours after it made landfall. There was no electricity and mobile telephone cell sites had been damaged and communication to the area would be re-established after the typhoon passed, he said. Civil defense officer Evaliza Agamata of Nueva Vizcaya — one of the four provinces facing the Pacific that are affected — said 5,000 people had been ordered evacuated from there, adding to 6,000 still in evacuation centers from the earlier typhoon. In the last four months, prolonged monsoon flooding, typhoon and storms across Southeast Asia, China, Japan and South Asia has left more than 600 people dead or missing. In India alone, the damage is estimated to be worth $1 billion, with the worst-hit state of Orissa accounting for $726 million. 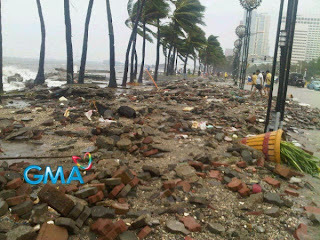 The damage from the earlier typhoon in the Philippines was estimated at $91 million. Nalgae, a Korean word for wing, was forecast to reach Luzon's western shore Saturday evening and exit into the South China Sea as a weakened category-1 typhoon as it moves toward China's Hainan Island on Monday.